We're revisiting an old friend, Mat, whose last piece posted here, will link you to two previous posts as well. Mat had dropped off my radar a while, but these photos remained in my inbox, awaiting to see the light of Tattoosday. Mat explains, "I've attached a new leg piece. I got recently of a cavna gypsy head. Dustin Golden from Roanaoke, VA. was doing a guest spot [at 713 Tattoo] and had a last minute cancellation. I jumped on it." What is a "canva gypsy head"? I'm still not sure, but Mat responded to my recent query for further clarification on the motivation behind the piece: "That Kafka mask was sort of a "gypsy" phase (which I am finding myself in now again). The real shiner of that piece was Dustin's red inks, which he mixes himself." Indeed. The piece just jumps out at you like a bolt of light in a dark alley. Thanks again to Mat for sharing and illuminating his ink for us here on Tattoosday! After a bit of a drought of inkspotting, I finally caught some new tattoos in Penn Station on Tuesday, along the L.I.R.R. corridor. Tom has "19 or 20" tattoos and is working to some day achieving a full sleeve on his left arm. 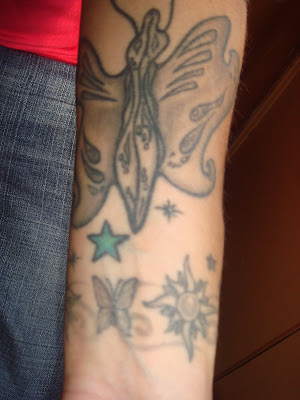 He offered me these two tattoos (for Tat-Tuesday), whose close proximity on his forearm made them the natural choice. 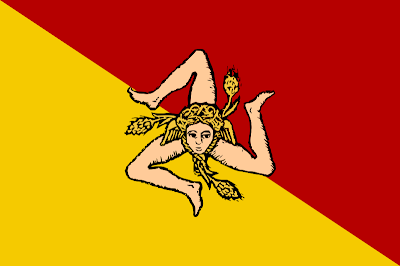 On top is the trinacria of the flag of Sicily. This symbol contains the the (winged) head of Medusa and three bent legs, which supposed to represent good luck and prosperity. It is a nod to his Italian heritage. 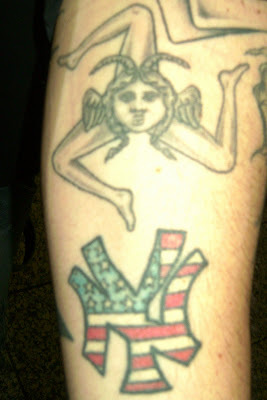 Below that is a New York Yankees tattoo which is very similar to my wife's cousin's stars and stripes-filled NY logo. Tom gave it a simple explanation: "I'm a huge Yankees fan". Say what you want about other cities, but I would venture to guess that the greater New York City area has a higher per capita count of hometown tattoos than any other metropolitan area. 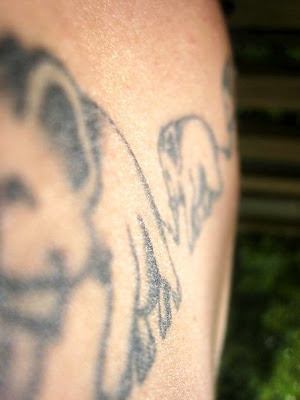 Tom's ink was done by Rob, owner of Skin Deep Tattoo in Levittown, New York. Work from the shop has appeared previously here. Thanks to Tom for sharing his work with us here on Tattoosday! Back in June, I introduced some awesome work on Fabiana here. 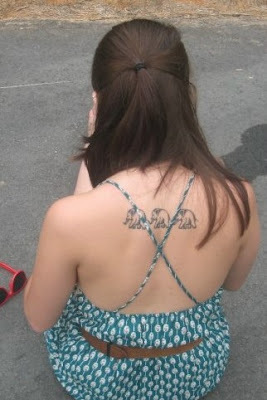 I followed up with her Saraswati tattoo here. 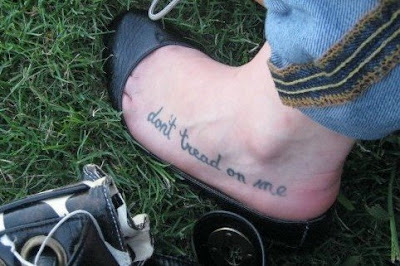 And then, her most important tattoo here. And now we're coming back to Fabiana to see what else she has to share with us here on Tattoosday. This post is called "Under Saraswati". "And under [Saraswati] on my wrist is also a matching tat with one of my exes, the same one that broke my heart. Well, it was once again butterflies because I love them and suns because she liked them. I love butterflies, they mean freedom. Oh, wait, my big giant butterfly is under the saraswati! I drew that one!" Just to clarify, the tattoos at the bottom of the wrist (the small butterfly and the sun) were the matching tattoos she got with her ex. 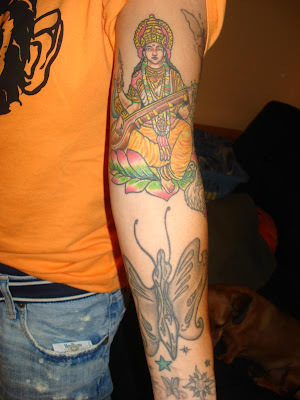 The larger butterfly above those, under Saraswati, was the one she drew. 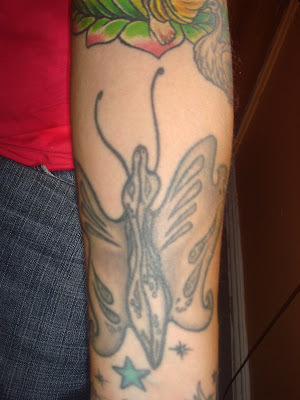 Butterflies have appeared on Tattoosday before here. Fabiana recently e-mailed me and told me she has some new ink to share, so I thought I'd post these leftover ones from the last batch she sent me, before I introduced some more. Thanks to Fabiana again for sharing her ink with us here on Tattoosday! Nathan over at KnuckleTattoos.com, who has featured Tattoosday content before, has now added me as a contributor, and I'm pleased as punch (and oh-so-thankful). My first contribution, although not original (it appeared in a longer form here first) is up and viewable here. I'm excited because affiliation with his site will expand my range of inkspotting and lend me some additional street cred. I mean, what sounds cooler? "Can I ask you about your tattoo? I write a tattoo blog..." or "Hi, I'm a contributing writer at Knuckletattoos.com....". Either way, I'm stoked to be expanding my repertoire, and am looking forward to a long and productive partnership with Nathan and his site. Here at Tattoosday, we're all about finding great ink on the streets of the greatest metropolis in the world, New York City. But we also occasionally get mail from the tattooed who I have not met, but who want to share. I had a little bit of backlog from earlier this Fall and am finally getting to some of the generous contributions. My name's Chris. I'm a freelance graphic artist who lives in the East Village. I stumbled across your blog when I was trying to track down an artist from New York Adorned - the one who did the tattoo I'd like to share with you. I hope you don't mind me just writing you like this, but I liked what I saw on your blog and I felt it would be a good place to share this piece. I am originally from Australia SC, but I came up here two months later to visit my brother for a week or so. The first thing I did on the Sunday afternoon when I got here was head to New York, but I have lived in the US since 1990. I have not gotten to visit home the whole time I've been in the states, which means I've missed all my cousin's weddings, as well as my best friend's and I've missed being there when they had their first children. Not having been home in all this time also means I never got to see my grandmother again before she passed away in June of 2007, which was just the most horrible feeling. At the time of her passing I was still living in Adorned. I'd already set up an appointment before I came up and I'd set aside funds just for the visit, so I went over there and Damion Ross got started on my memorial piece. 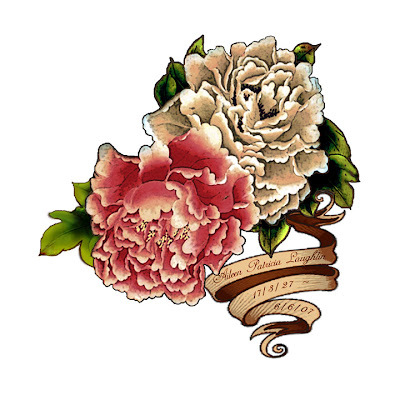 The piece was originally a painting that I did and Damion did some redesigning to make it truer to the style of tattoo that I wanted, so the end result is really the perfect tribute to my grandmother who loved her garden and flowers. The tattoo required two sessions and it cost more than any of my other work, but you really can't put a price on a piece that commemorates the life of someone so dear. Just for frame of reference, I have been recovering from severe facial injuries for almost four years. At the time I made the trip up here to get the tattoo I was out of work and had no income, other than a measly settlement that a judge had begrudgingly awarded me for Social Security. I spent a sizable chunk of that settlement to memorialize my grandmother, even though I had no idea when I'd have income again. My point is that people should not be stingy when memorializing a loved one, because you're going to be carrying that reminder with you for the rest of your life. Do you really want to be reminded of how cheap you are? Give them prime real estate and wear it proudly. Damion Ross' work has appeared on Tattoosday previously here. And New York Adorned has been featured many times, as evidenced here. I'm glad to be able to share my ink and story. I am working on getting some good coverage, but that's kind of hard to do when your income is extremely limited. I've collected images and put together designs for a number of years, but this was one that I wasn't prepared for at the time, nor did I have any idea that my next tattoo would be a memorial piece. 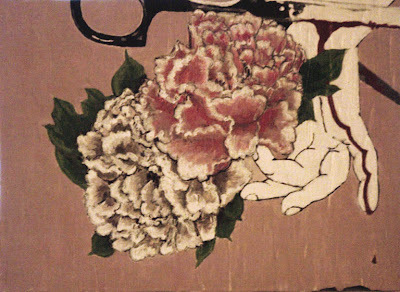 So I set about searching images for my design - looking through numerous illustrations of Japanese floral paintings, as well as photographs of flowers and different types of traditional tattoo banners. I also made sure I did my research on the symbolism of flowers in Japanese art - both for flower type and colour, as these details are of great importance. When I'd found some good, solid reference material, I was then able to start on the design work. I did a strong pencil sketch from a photo of peonies, the two most opulent blooms and capturing as much detail as I could. I spent a good number of hours sketching to make sure I had a good solid foundation. When I'd completed the sketch I scanned it and started to colourize it in Photoshop to make sure I'd have just the right colour scheme. Once I had that down I started painting what would be my first floral painting ever! I have to honestly say I amazed myself, as I wasn't even sure I could paint flowers, but my eye didn't betray me and the results were fantastic. That said, it was the digital version that I took to New York Adorned and it ended up being simplified considerably, but the image became more bold in its simplification. It isn't often that I receive such an in depth analysis of a tattoo from someone. It's clear that Chris being an artist has magnified his passion about this art form. I appreciated the opportunity to share his thoughts here with everyone on Tattoosday. 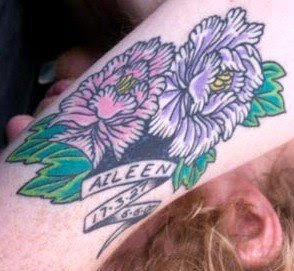 Once again, much thanks to Chris for illuminating his beautiful memorial tattoo for us! I'm an avid Tattoosday reader. I, like many others, enjoy the stories that connect us all through one mutual love: tattoos. Sorry about the poor focus of the pictures. If it makes the cut for the site, feel free to crop. My camera is under repair right now, so it was just randoms I found! 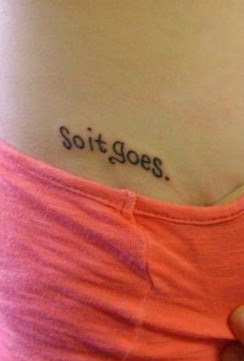 Thanks, Alli, for sharing your ink here with us at Tattoosday! And thank you for waiting so patiently for me to process your post! I wrote the majority of this post on the way home from my friend Tom Wacker's memorial service on November 12, 2008. I am currently recovering from some outpatient surgery and will use my recovery time to attempt to catch up on things here at Tattoosday. So I am on my way home from Tom's memorial service. A friend gave me a ride from the church in Ft. Lee, New Jersey to the P.A.T.H. station in Hoboken. I catch the P.A.T.H. to the World Trade Center station in lower Manhattan. I walk a little disorientedly and find the 2 train at Park Place. I switch at Pacific/Atlantic for an N express train. Standing there in the last car is a bike messenger with full-on ink - his neck is covered and he's got his hands and wrists done. 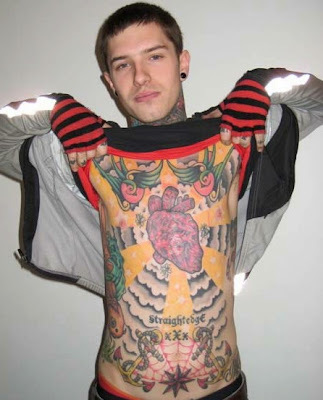 And his long-sleeved sweatshirt is undoubtedly covering a goldmine of tattoos. Street, I'll stop him on the platform. And Tom is backing me up from on high. The messenger exits the train when I do. So I introduce myself and hand him my card. I apologize for not having a flier, but he stops me: "I e-mailed some pictures to you already." I've never met this guy before in my life. But I look at him, and recognize his face. His name is Eric and he sent me shots of his phenomenal work back in September. The nature of his work, and the sheer size of it, meant that his face was visible in the photos he sent. Wow. And I've been meaning to post his photos, but they're so rife with incredible work, I couldn't get a handle on it. And I've been busy. And on and on and on. But now he is "legitimized" as an actual Tattoosday encounter. Of course, I am convinced Tom is behind this coincidence. Whether it's true or not is irrelevant. It makes me feel better. Tom saw these photos when I first received them, and was similarly impressed with the quality and scope of the tattoos. I think it's apparent why I didn't post them immediately. Where to begin? I like discussing elements in detail, and it seems I could write a novel about Eric's work. 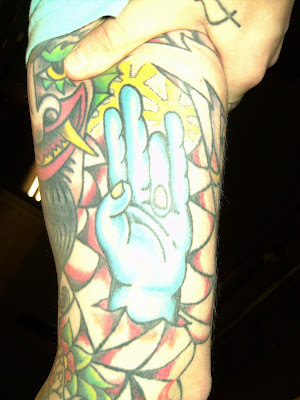 The Shocker tattoo was inked by Jim Class of White Tiger Tattoo in Rochester, New York. In a follow-up email, Eric had advised me that Class "did my turtle neck sleeve, right arm, sides, armpits, entire front, and my left leg. My back, head, and right leg sleeve were done by Mike Dorsey at Permanent Productions in Cincinnati, OH. I've gotten a few souvenir tattoos and conventions along the east coast." So we've started out small. Stay tuned for future visits from Eric's canvas. I offer him thanks for the initial photos and for stopping to chat with me at 59th Street. And thanks again to Tom for being so instrumental in the success of Tattoosday. I'm following up from this post here. Nina had offered up so many tattoos I had to split up the post, and then, well, she sort of got lost in the inkshuffle. Best to reacquaint yourself with her through the post above and then resume here. She says this is a reminder, based on her upbringing, that she can "find simplicity through silence". The saying is punctuated by the recognizable symbol of the fleur de lis, which has been recognized as a royal French symbol for purity. This piece has roots in her family. Along with the decorative aspects of the design, the letters N and T represent her name and the name of her brother Tom. The name Rita belongs to her mother. 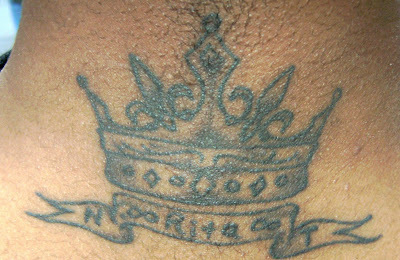 The crown represents her mother being the queen of her family. 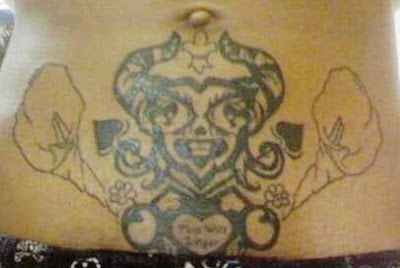 Note the fleur de lis just below the navel. Added to this design, on either side, are two calla lilies, a la Georgia O'Keefe. They, to her, represent "the realm of possibility". Nina told me that she and the tattooer discussed adding white ink to the flowers to make them more "realistic". They decided against that, however, as the tattoo may have suffered due to what likely would have been an aesthetic issue with the ink and Nina's much darker skin tone. I would tend to agree that they made the right choice. Nina credits most of her work to Dan at Amazing Grace Tattoo in Geneva, New York. She did however indicate that the lower abdominal piece was done by Noah at Extreme Graphix in Geneva, NY. I would like to thank Nina for spending so much time talking to me about her ink. She showed me her whole catalog of tattoos, and I feel bad for neglecting "part two" of her post for these past couple of months. Considering that she had all this work done in her eighteenth year, I can only wonder how much more has been added to her canvas since. 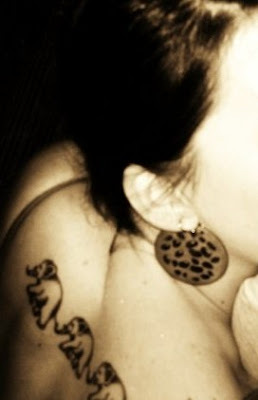 Thanks, Nina, for sharing your body art here with us on Tattoosday! Late Thursday night I received a phone call I wish had never needed to be made. My friend Sheri called me to tell me that her fiancé Tom had died unexpectedly earlier that day, the victim of an aneurysm. He was only 42. People die every day in America, in the world. Young, old, healthy, sick. Death is a fact of life. Here at Tattoosday, we acknowledge that. Memorial tattoos abound. But Tom was not just anyone. He was my friend, and he was with me from the beginning of this venture, one of Tattoosday's earliest fans and supporters. Not only did he offer up his own ink (reposted below), but he was always on the lookout for me, and saw most of the photos before they made it to the blogosphere. We'd exchange messages and updates over the weekends, and he always anticipated my return from lunch on weekdays, to see if I had spotted any awesome ink. He knew how much I was yearning for a better camera, and he ended up getting me a new one, with Sheri, for my birthday. And if we weren't talking ink, we were talking music, both of us big fans of Iron Maiden, Guns N' Roses, AC/DC, and Metallica. 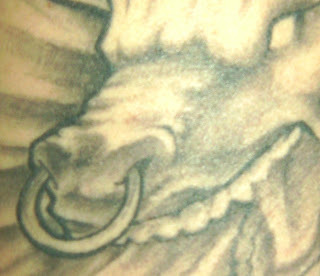 Below is the post I ran of his tattoo, a grim reaper from his metalhead days. It's not spectacular work, but it graced his skin, and made him one of the inked nation. I have been posting less, of late, but Tom's spirit will live on through Tattoosday. For he is the audience I envision while writing. I know he would tell me not to mourn, but to keep on doing what I love, blogging ink, meeting new people, and showcasing their body art for all to enjoy. I'll miss you, Tom. This blog's for you, too, wherever you are. I spotted Raul outside of F.I.T. and stopped to ask him about this portrait on his inner left forearm. The gentleman pictured is Raul's father, based on a photograph of him taken when he was serving as a paratrooper in the Armed Forces of the Argentine Republic. Raul told me he always had a special relationship with his father, who had always wanted his son to follow in his footsteps in the military. Raul explained that his father, however, changed his tune about this late in his career. Raul did not indicate whether this was due to his father's feeling about life in the military, or a result of his seeing that his son was not meant for a life as a paratrooper. Regardless, the portrait is a touching example of a son's affection for his father. 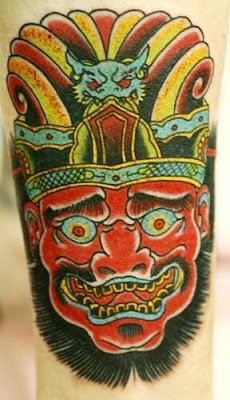 Raul credits this piece to Triple X Tattoo in Manhattan, and remembered the artist being from Australia and named Mike. A call to Triple X did not clarify this, as I could not connect the three elements to positively identify the artist. 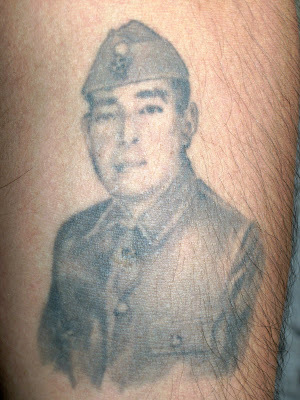 Nonetheless, thanks go to Raul for sharing his inked portrait of his father with us here on Tattoosday! 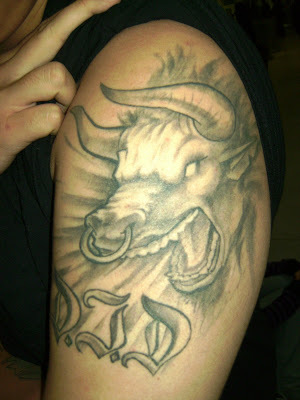 The DJD under the bull represent his and his brothers' first initials (Dakota, Jason, Derry). This piece was tattooed at his house in Florida by a family friend, "Crome," who specializes in tattoo and graffiti art in Miami. Check here to see Crome's work in Miami. He apparently is one of the trailblazers in the form of "MSG," or Miami Style Graffiti.